Chicago is one of the fastest growing centers for start-ups in the country, and crowdfunding is part of that engine. 25 space entrepreneurs and enthusiasts came together at Chicago’s mHub incubator on June 15th to learn from some of crowdfunding’s best experts and advocates. NewSpace Chicago founder and meetup moderator David Hurst opened with a short background on crowdfunding, and some successful examples from the space arena, including SpaceVR, the Integrated Space Plan, ArduSat, and the LightSail spacecraft. These range from informational products to virtual reality experiences to full-fledged experimental spacecraft. All of these were crowdfunded, all exceeded their funding targets, up to six fold! Crowdfunding is the practice of funding a project or venture by raising monetary contributions from a large number of people. Crowdfunding has proven to be a successful and innovative new path to funding start-ups. Space-related start-ups need to be aware of its unique opportunities and challenges. 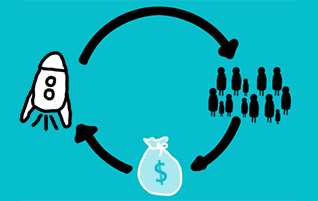 There are four sub-types of crowdfunding: reward-based, equity-based, debt-based, and donation-based. If you have ever donated to Kickstarter or Indiegogo, you are familiar with reward-based crowdfunding. GoFundMe is a good example of a donation-based model. The NewSpace Chicago panel focused primarily on equity-based and reward-based funding approaches. NewSpace Chicago was joined by four distinguished panelists: Tim Hogan of Crowdsource Funded, Florence Hardy CEO of TruCrowd Illinois, Jeremy Lane Director of Advisory Services at TruCrowd Illinois, and Brian Hirsh Director of Marketing and Design at Fantem Technologies. The USA JOBS Act, signed into law in 2012, opened up start-up investing to non-accredited investors in a way never before possible. The net effect of this is that there are about 100 million new investors now accessible to start-ups. Equity-based crowdfunding may be more accurately labeled “crowd-investing”. With crowd-investing, the startup gains “loyal money,” where the investor is more likely to be cheering you on, sharing your story with their social networks and personally and emotionally invested in your success. By comparison, VC’s are “smart money”, focusing on traditional ROI metrics. That is not to say individual investors aren’t smart and that VC’s aren’t loyal – but their core motivations tend to be different. Market your crowdfunding long before you start your campaign. Pre-campaign marketing is crucial to your success. The panelists also, of course, addressed the application of crowdfunding to the New Space sector. The key themes across everyone on the panel were revenue, profit, and education. Start with showing a path to profit and a viable revenue model. Then, people invest in what they know, so find a way to make your space start-up accessible and understandable to your target crowdfu nders and crowdinvestors. Also, do not lose sight of leveraging the “by-products” of your development process in reward or perk-based campaigns, such as test articles and “meet the team” events. Follow the link below for highlights of the NewSpace Chicago event on Crowdfunding Your Space Start-Up. https://www.youtube.com/channel/UCtWI3n6NHrgravYvfaX2T3w . “Crowdfunding Your Space Start-Up” was the 18th Meetup in a continuing series of space entrepreneurship discussion and networking forums presented by NewSpace Chicago and hosted at mHUB Chicago. NewSpace Chicago is a start-up ecosystem fostering the development of private companies commercializing outer space. NewSpace Chicago (NSC) builds upon Chicago’s unparalleled foundation of industry, technology, and education to provide unique advantages to entrepreneurs pursuing space opportunities. NSC provides a forum for start-ups to engage with space industry experts, to learn about the unique opportunities and challenges of space development, and to help develop their vision. NSC also provides an arena for investors to learn about the “new space” industry and meet with potential early-stage start-ups. Sign up for NewSpace Chicago’s MeetUp announcements at https://www.meetup.com/NewSpace-Chicago/ . mHUB is Chicago’s first innovation center focused on physical product development and manufacturing. By connecting the manufacturing sector with the vibrant technology entrepreneurial community, mHUB will ensure Chicago’s legacy remains that of a beacon to a region that builds products, and also the future.